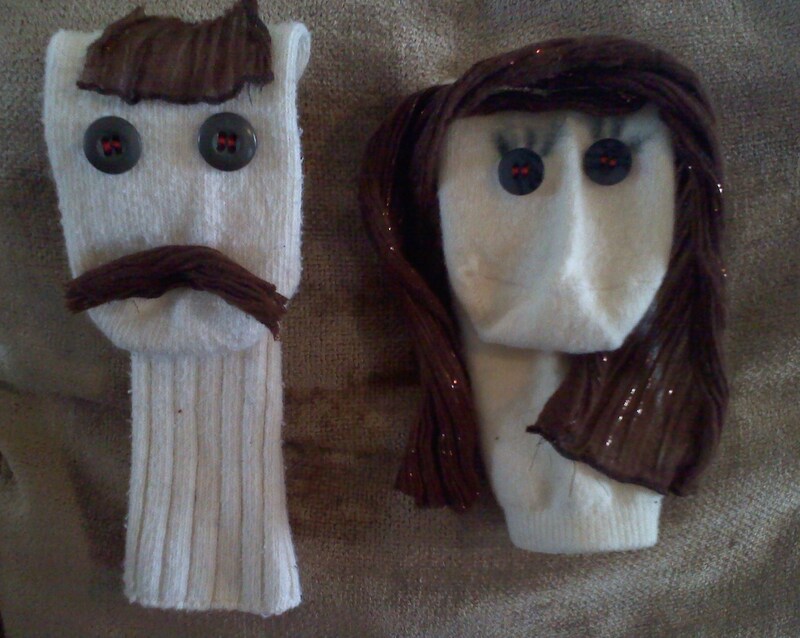 This weekend my daughter saw a sock puppet on an old episode of Blues Clues and immediately wanted to make one herself. I knew this would require my supervision because if left to her own devices, she would dance and prance around with a sewing needle and no one needs that kind of stress. She was a very patient little seamstress and took great care in picking out the perfect button eyes. After I got them started and gave her a little instruction, she had a great time sewing them on, then giggled as I decided to cut up an old scarf to add hair. After we were finished she hugged the puppet, named it, “Socka,” and walked away announcing over her shoulder, “it sure would be nice if Socka had a friend.” That child knows how to work me. Sitting with all the socks, fabric and needles and feeling a spark of Martha Stewart (which, trust me, I NEVER feel) I decided I would create a sock life-partner for Socka. As I was sewing and probably humming a merry little tune, ’cause that’s what you have to do when you sew, or haven’t you watched any Disney movies lately, my son walked in to the room. Such honesty and narcissism rolled in to one offhand comment. It struck me that my son cannot imagine me jet-setting, having an office outside the home or doing something that fulfills me in a creative way but he can imagine me dead and evidently THAT’S when he plans to tackle a few new skill sets. After I promised him we could give the puppet a moustache, he agreed to help and was a button-sewing fool but this was a wake-up call. I’m raising completely dependent children. My son turns 10 next month and I fear he’ll be the kid in the college dorm who doesn’t cook, rarely changes his underwear and doesn’t comb his hair but can, “totally beat the challenging levels” on his video games. I’ve got my work cut out for me, you know, before I die. Categories: Blog, Uncategorized | Tags: blues clues, children, mother, puppet, skills, sock | Permalink. This is a cute post 🙂 Your daughter sounds adorable! Socka is, most certainly, the best name for a sock puppet. Great Post!!! Socka an friend are AWESOME!!!! I freaking love you. And your weird, dependent, prancing, sewing, video gaming, dirty-underwear-wearing kids. You’re a good mama, you.